Good Luck and Make Sure Your Hooks are Sharp! Winter Springs (Kings) 6 to 15 pounds. Best Lures: cut plug herring, herring strip, plugs and 4″- 5″ spoons. Winter Springs (Kings) 6 to 25 pounds. Best Lures: cut plug herring, herring strip, plugs and black hoochies & flashers. Winter Springs Best lures: cut plug herring, herring strip, plugs & 4″- 5″ spoons. Bluebacks -light rod, 10 to 12 pound test, bucktails on surface or small 3″ to 4″ silver spoons. Blueback -3″ apex, green, black chrome or pink; small silver 3″ spoons. Springs are slowing down but this is the time for that 30 pounder! Be ready! Bluebacks are growing into 4 – 6 pound Coho salmon, hungry and willing to bite! Hello halibut! These fish are migrating from the north where they are spawning and boy are they hungry, watch weather and tides for best fishing times. Average size 10 to 40 pounds. Best halibut lures: big bright jigs, fresh bait, octopus and herring. These are the most popular months for all fishing and the fish are here in great abundance! Springs are feeding aggressively. Herring schools are everywhere and the fish are now 19 to 50+ pounds. Make sure you have plenty of good line on your reels. Coho are schooling up and ready for a fight. Some of the local guides report catching up to 25 coho a day on light gear. Look for the fish along kelp beds and tide rips, fish both sides of the tide changes for 3 hours. Halibut are most popular in these months. Make sure you have good gear for these monsters. A good stiff 6′ to 7′ rod, braided lines from 50 to 130 lbs test and lots of it. A good gaff is necessary for the smaller ones (under 40 lbs). A good shark hook and rope or harpoon for the bigger ones, up to 300 lbs!. There are two very important things to remember about fishing halibut. Never bring a halibut bigger than 40 lbs into your boat and second, make sure you have a boat bigger than the halibut!! Go to your local sport shops for information on catching these fish, they will be happy to help. 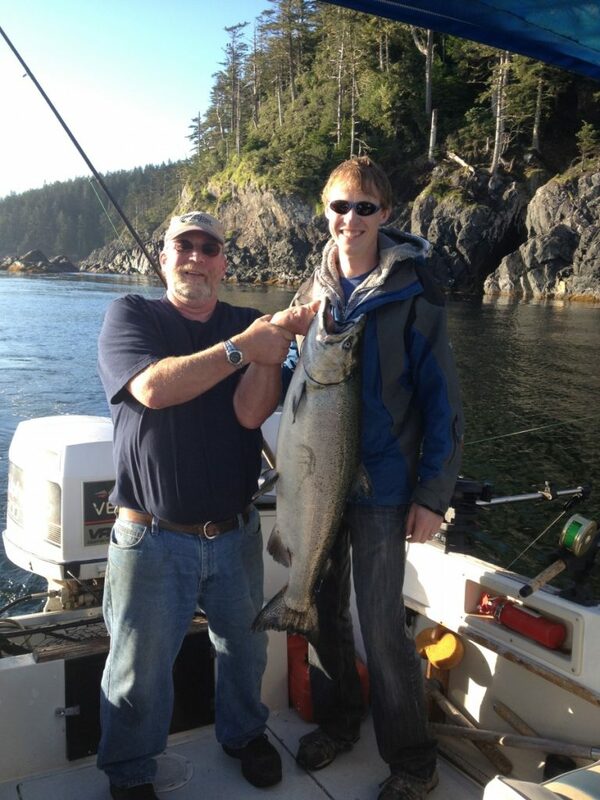 Coho are huge, up to 20+ lbs and very aggressive, you will need lots of line on your reels and 15 – 20 lb test. Springs consist of lots of feeders for the first 2 weeks and the fish are from 20 to 60 lbs. Make sure all your gear is in good shape. Chum salmon are entering the rivers this month. These fish grow up to 20 lbs +. The best lure to use are jigs, buzz bombs, stingzildas or gibbs minnows. Best colours are white, yellow or bright green. Don’t forget to keep an eye on the weather! This is the time to get all your gear ready for the next year, tell tales of years past, and plan the next year’s dream fishing trip, it is just around the corner.